Bathsheba is one of many women in the Scriptures that have been misunderstood or portrayed badly by scholars. Taking time out to read what the Bible actually says about her reveals that Bathsheba was a woman of strong character. She found grace to put her husband’s sins aside and forgive him. She found the strength to forge a good marriage and become one of the foremost mothers in Israel. In spite of even horrible sins as adultery and murder, God is good and forgives when a sinner truly repents as David did. God graciously went further and blessed David and Bathsheba with a good marriage. Of course they suffered the loss of the son that was conceived in sin. God then blessed them with four sons including the future king, Solomon. Adonijah and his followers fled. Solomon showed Adonijah mercy and let him return home. Solomon was safely on the throne now. Adonijah unfortunately would not learn his lesson. More about that in a moment. Bathsheba had acted wisely and courageously when her son Solomon was threatened. It seemed that all of Israel was going after Adonijah. She and Nathan were alone in approaching David. Yet Bathsheba relied on God’s promise and David’s faithfulness that her son would be the next king. David respected this intelligent, resourceful woman and acted upon her request immediately. Bathsheba’s son was promptly made king. Bathsheba was a wise woman. But in the last story we read of her in the Bible we see her acting in a rather puzzling way. It has to do with her stepson Adonijah. 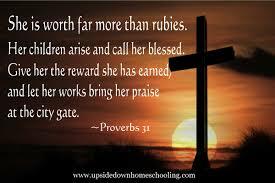 King Solomon loved and respected his mother and he welcomed her visits. Solomon had another throne placed at his right for Bathsheba when she was present as the queen mother. After his ascendancy to the throne Bathsheba went to see Solomon with a request from Adonijah (1 Kings 2:13-25). And so Adonijah approached Bathsheba and asked her to get Solomon to give him David’s concubine, Abishag. 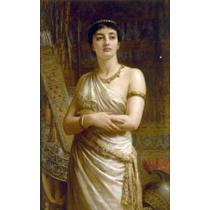 Though David had not cohabited with Abishag, she was still considered a concubine. Whether or not Bathsheba knew what Adonijah was really asking, Solomon did. The king sent one of his men to execute Adonijah immediately. Either Bathsheba was fooled by Adonijah or perhaps she just had a very tender heart. It is difficult to see why she would even think that Solomon would grant Adonijah’s wicked request. Perhaps she really hoped that Adonijah meant the best. After all, when he greeted her he assured her that he had come “peacefully”. Others have suggested that Bathsheba was wise enough to know that Adonijah had not repented and would always be a threat to Solomon. Perhaps Bathsheba took his request to Solomon so that Solomon would have an excuse to remove this rival and consolidate his throne. I guess we’ll have to wait until we get to Heaven to know for sure, but I believe that Bathsheba was a kind and forgiving woman. She certainly showed that in her relationship with David. She raised her sons the same way. Don’t waste time with the Hollywood version of Bathsheba. Read what the Bible says about her. She should be remembered as the wise, gracious, godly wife and companion of two of Israel’s greatest kings. Michal the daughter of Saul had no child to the day of her death (II Samuel 6:23). What a sad thing to happen to a married woman. What brought this about? Was it all Michal’s fault? Michal was a princess. She was the daughter of King Saul and her mother was Ahinoam. She lived in Israel at the time of the beginning of the monarchy around 1050 BC. Her brother was Jonathan the great friend of the shepherd boy, David, who would later be king. The story of David and Goliath is a very familiar one. We all know what a hero David was and how he went on to defeat more and more Philistines. Saul became jealous of David when the Israelites began to sing higher praises for David than himself. At this point in our story, Saul does not wish to raise a hand against David himself, but hopes that the Philistines will get rid of David for him. He offers David his older daughter, Merab, to be his wife, but David humbly refuses. Later Saul gives Merab to another man and offers his younger daughter, Michal, to be David’s wife. Here is where the story gets interesting (I Samuel 18ff). It could be a real romantic story, for Michal loves David. Like the knights in another era, David accomplishes a hard task in order to win Michal’s hand, because she is after all a princess and he is only a shepherd. Saul is really hoping that the Philistines will kill David when he sets him out to get a dowry for his daughter. Saul asks for one hundred foreskins of the Philistines. David is happy to go and accomplish this task, and he outdoes the bidding by bringing back two hundred foreskins. Now he feels like he is good enough to be the king’s son-in-law. David and Michal are wedded and it seems to have been a happy marriage for as long as they were together, until Saul again began to persecute David. Now Saul is afraid that this couple will supplant him, becoming the rulers in his place. So once again Saul plots to kill David. 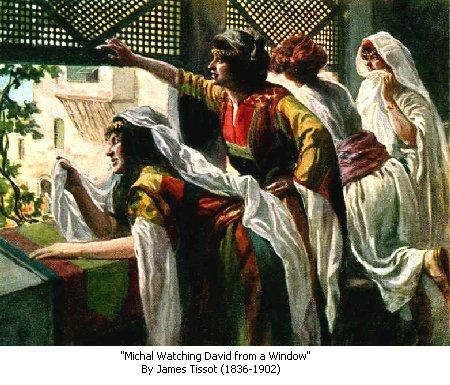 Michal learned about this and helped David escape from their house (I Samuel 19:9ff). Michal went so far as to deceive Saul’s messengers when they came to get David. Now here is something interesting to take note of: Michal used a household idol to put in the bed and cover up to fool the messengers. What was she doing with an idol in her house? This is a clue to Michal’s problem. By the end of our story we will learn that Michal never really honored God as she should have. Many have condemned Michal for lying to protect David. All kinds of things have been written about her moral dilemma- the choice between the lesser of two evils. Is it ok to lie to save a life? Both lying and murder are sins. How do you solve this problem? Michal would not be the first one we see in the Bible who lied. The midwives lied to Pharaoh. 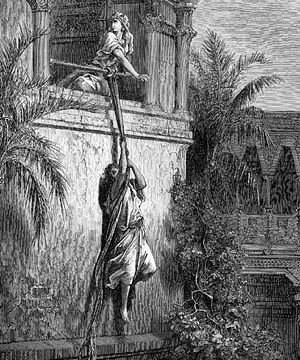 Rahab lied to protect the two spies. Even Michal’s brother, Jonathan, will lie to Saul later to protect David. These are things that only the individual before God can decide. What this story shows us is that Michal, David, Saul, and Jonathan were real people just like us living in a sinful world who have to make decisions and live with the consequences. Here though Michal lies to protect herself and she slanders David in the process. Again we see that she is not honoring God. Back to the story – Saul gives Michal away to another man, Palti. Of course this was illegal since Michal and David were not divorced. How did she feel about this? The Bible doesn’t really say, but here is where she gets a lot of sympathy. It seems that King Saul just used his daughter like a pawn doing to her whatever he wished. Saul was very cruel. Even in ancient times, daughters were not forced to marry someone that they really didn’t like. We do not know if Michal protested or not, but we get a hint of her feelings later when she returns to David. Michal and David live apart for many years while he was on the run from Saul. David takes two wives during this time, Abigail and Ahinoam. But when Saul is dead, and David becomes king in Judah, he wants the woman whom he still considers to be his wife to be returned to him. Of Saul’s sons, only Ish-bosheth remains alive and he is reigning in the rest of Israel. Ish-bosheth sent and took Michal from Paltiel and sent her to David. She apparently received the news coldly and unemotionally returned to David. We are only told that her husband, Paltiel went with her part of the way weeping the whole time. Here is another clue as to her haughty personality. David continued to wage war with Philistines. Two traitorous men murdered Ish-bosheth and the way was cleared for David to reign over all Israel. David was appalled at their treachery and had them put to death for the murder of the rightful king. Then all the people of Israel made David king over them. David grew stronger and stronger and took a whole lot more wives and concubines. Many sons and daughters were born to him. Today, it is hard for us to understand how Michal or Abigail or Ahinoam felt about this. I guess it was just part of the culture and they accepted it as the way kings lived. Anyway, for purposes of our story we cannot assume that what happened next was due to jealousy on Michal’s part. We have already seen that she is cold and calculating. She was very proud. She wanted prestige, not holiness. She was an idol worshiper not a faithful Israelite. When David was young, she loved him as a good-looking hero. Now that they are older, she despises David for his piety and humbleness. David decided it was time to bring the Ark of God back to Jerusalem. We are familiar with the tragic part of the story when Uzzah reached out to keep the ark from falling and God struck him dead for his irreverence. David left the ark with Obed-edom for awhile, but eventually went to retrieve it (II Samuel 6). What a joyous day that was. David came in ahead of the people dancing and wearing only a linen ephod. He had set his royal robes aside and put on a simple garment and was rejoicing with the people as one of them. Michal the daughter of Saul looked out of the window and saw king David leaping and dancing before the Lord; and she despised him in her heart (II Samuel 6:16). How sad that her love for her husband had turned to hatred. When he approaches his house she comes out and nags at him about the way he was dressed. Is she really concerned with David, or is she concerned with her own status as a queen married to someone she considers foolish? Why isn’t she rejoicing with the others that the ark of God is back and that the Israelites are enjoying relative peace for awhile? David responds that he was worshiping the Lord and that it is too bad that Michal will not show him the esteem that he is due as king. I think that he was probably also sad that she was not a woman after God’s own heart the way that he was a man after God’s own heart. 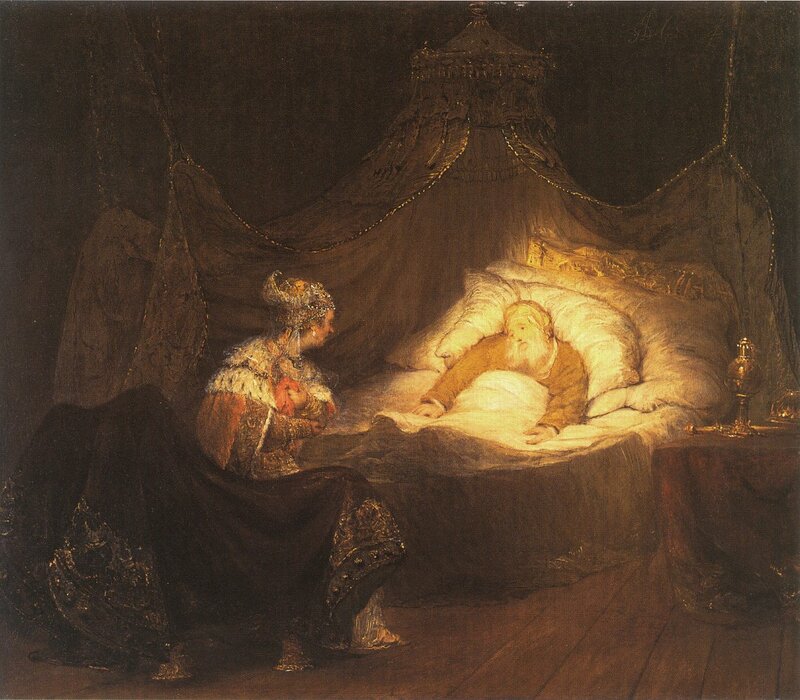 And so, Michal continued to live in the king’s house until the day of her death, but they had no marital relations and she never had a child. The story could have had a different ending if Michal had loved God more and herself less. How tragic that she let the bitterness in her heart ruin her life.